Capsule Summary: B.J. gets obsessed with the idea of getting relatives back in the States together for a party but Klinger worries his mother will find out he’s stationed in Korea. Meanwhile, the 4077th bugs out. Hawkeye calls Charles a weak link for not wanting to participate in B.J.’s stateside party, but the weak link in this episode is Klinger and his storyline. M*A*S*H got a lot of mileage out of Klinger and his wacky family members, many of whom he may have made up. He explains in “The Party” that his parents don’t speak English and his mother believes he’s stationed at Fort Dix in New Jersey. He’s been sending her photographs every month so she doesn’t worry about him being in Korea. That’s sweet and all, but it sort of falls apart when you think about it. For one thing, if I recall correctly, in Season 4’s “The Interview” Klinger says hello to his parents. More importantly, we’re supposed to believe everyone in Klinger’s family has been lying to his mother? More precisely, we’re supposed to believe Klinger believes his entire family has been lying to his mother? What makes the least amount of sense, however, is why Klinger’s mom–assuming she truly did believe he was stationed at Fort Dix–wouldn’t think it a little strange that family members were gathering for a party in New York City when New Jersey is so close? I know I’m really overthinking this. It’s not a big deal and it doesn’t ruin the episode. It just bugs me. The idea of gathering family members for a party is a nice one. It’s amusing to see how wrong nearly everyone was about their relatives not wanting to get together. Hawkeye was wrong, Margaret was wrong, even Charles was wrong. His reaction upon reading that his parents were interested in attending is perhaps the best part of the episode. The montage in which the characters try to find a date for the party that works for everyone is unusual but effective. M*A*S*H didn’t often use montage sequences. I wonder how much time passed during this episode. The 4077th was bugged out for roughly three weeks and it must have taken many more weeks–if not months–to send letters back and forth to the States planning the party. To be honest, I think the episode would work better without the bug out plotline. The ending feels rushed. I wish we heard more about the party. Finally, it’s never confirmed whether relatives of other people at the 4077th attended the party or just the main characters. During the convoy, when everyone is reading their letters, Kellye excitedly tells B.J. the party is on. This suggests to me that her family was involved. Otherwise, why would she be so excited? The faked Fort Dix photograph. According to the Internet Movie Database, producer Burt Metcalfe made an uncredited appearance in this episode as a driver. Anyone know the source for this or where he supposedly appears? Margaret mentions her divorced parents. Earlier in the series, her father was supposedly dead. He later appeared in “Father’s Day” during Season 9, when the divorce was mentioned again. Good points about the storyline of Klinger’s ‘Fort Dix’ lie. 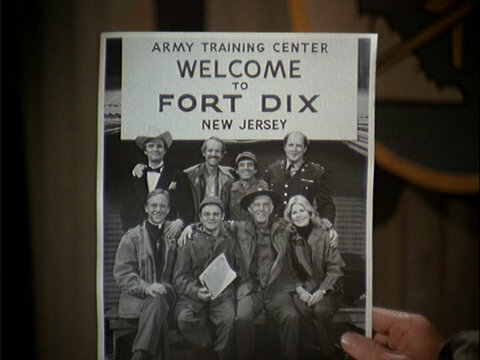 Perhaps it would have worked better (and not conflicted so badly with series continuity) if they would have used the “Fort Dix” lie and applied it to one of the minor characters like Igor or Roy (or even one of the nurses)? Charles being so upset about his parents and Radar’s folks hitting it off at the party is hokey (as well as their planning another get together in the future). But it works for me because Stiers acts the part so well, to the point of being willing to surrender to the Chinese to avoid having to stoop to the level of the O’Reilly’s. While this is a good episode and I like it, there’s one glaring thing about this episode that doesn’t make sense to me: B.J.’s spinal patient needed attention as quickly as possible – especially since it seemed like the bug out may have damaged his spinal cord, so he was being shipped out to the 121st EVAC in Seoul the following day. After the 4077th returns to the original encampment in Ouijongbu, Radar informs B.J. the surgeon at the 121st finished operating on his spinal patient and he’s going to be okay. Now, here’s the thing: at one point, Hawkeye mentions that the 4077th was at their new camp for three weeks (because apparently that’s how long it took Potter to fix up his new tent), and B.J.’s patient supposedly needed attention right away . . . so what did the 121st do with him for three weeks in the meantime? And I don’t know where they got the idea from, but that was not Burt Metcalfe driving the ambulance with B.J. and Kellye – if you’ve seen pictures of Burt from back during M*A*S*H’s production, and you look at the ambulance driver, they look nothing alike. I’m glad that I am not the only who always wondered about the time frame of BJ’s patient’s surgery. I was too busy picking apart Klinger’s storyline to wonder about B.J.’s patient. Also, I think–but am not 100% sure–the ambulance driver in question is Dennis Troy without a mustache. Honestly, this is one of my least favorite episodes. The very thought of getting stateside relatives together for a party, to me it’s a horrible idea. It’s just not believable, and even with the usual suspension-of-belief used for television, personally, it doesn’t work. It’s hokey, and ultimately reeks of a preciousness that (sometimes) tends to color the later seasons of M*A*S*H.
Am I really supposed to believe that Hawkeye, who ostensibly shares such a close relationship with his dad, would seriously think his father wouldn’t attend a party for him? I mean, I get WHY he’s questioning it, but nevertheless, that aspect really irritates me. And the whole Klinger-Fort Dix thing, that’s just supremely stupid. Plus, the letter at the end regarding Winchester’s parents is cringe worthy. To top it all off, the whiny BJ of seasons 7-11 is particularly annoying here. I know I may be in the minority, but I just really, really don’t like “The Party.” Never have. I’d take it over “Inga,” but that’s not saying much. Thank you so much for pointing out how annoying and whiny BJ is here. The actor keeps using this high pitched voice to convey his excitement that made me turn my volume down because it was grating on my ears. I’m so sick and tired of the only emotion he ever showed it for your wife or a patient he thought he might lost. He’s so two dimensional that it makes so his storylines predictable. Funnily enough Mike Farrell believed that he made him more interesting by having him take part in some of Hawkeye’s practical jokes. We had that in Trapper too and he was infinitely more interesting and entertaining. I didn’t like BJ when I watched the show back in the 80s and I like him even less now. Not to mention he acts like a baby when he doesn’t get his way. The spinal cord is damaged so he sulks and says he’s not going to do the party anymore. He actually says, “I don’t care about anything.” Reminded me of my 7 year old niece. I get tired of hearing people asking BJ what’s wrong. Seems like every episode he’s got some problem that he takes out on everyone else. This is one of my favorite episodes, despite being in one of the worst seasons. Maybe it’s unrealistic but to me the thought of having all their families meeting stateside is great, and just makes you feel good for the characters. I’m glad Radar was there too as he missed alot episodes in Season 7 and was out the door after that except for his goodbye episodes. I do agree on some of the points mentioned here. The bug out is not really needed, and took away from more time we could of gotten about the party. It would have been nice to have a couple more letters from the other family members read. I also wonder how long it took to plan the party, and have actually often wondered how long it really took to get mail to Korea in that time. I would assume letters and packages went by plane, rather than boat by the time of the Korean war, but I bet it still took weeks at least for letters to be delivered in the 50’s. It must have been a long and drawn out process to go back and forth for so long. It’s was always funny to me how there was no mention of the other camp members families being there. It didn’t seem to me like any of them were invited, despite Kelleye being so excited. I actually always thought it was kinda rude and inconsiderate to not include them, but then obviously those are really just background characters and getting even more people involved would be difficult. I’m curious, why do you feel Season 7 is one of the worst? Personally, I always considered it to be the last “normal” season of the show, but at the same time, I also feel like it’s the “transition” season: not quite as humorous as the previous six seasons, but definitely nowhere near as dark, preachy, and depressing as the ensuing four. I wouldn’t say Season 7 is THE worst, but it’s definitely the worst of the 7 up to that point, and also a little worse than season 8 IMO. The past couple months I have been going through the whole show on DVD, and just finished Season 8 last night, so this is fresh on my mind. I also really don’t like BJ as a character. Sometime’s he’s okay, but for the most part he’s passive aggressive, underhanded, and jealous in a more quiet way, as opposed to Hawkeye who’s very outspoken over something he’s jealous of. So up through season 5, the show was great, even 4 & 5 since BJ was still settling in as a character, Radar was there the whole time, and Gelbart and Reynolds (or just Reynolds in season 5) were still there. Season 6 was the first season where the show had a VERY noticeable drop in quality, but Season 7 for me is the first time the show got to be almost annoying. There’s also too many episodes with the same kind of premise starting around season 7. It’s too cold, it’s too hot, we don’t have any supplies, morale is low, Potter’s angry about something, Hawkeye, Hawkeye Hawkeye. The show was always about these things, but starting around season 7, it’s like they were on a constantly rotating wheel of repetition. I mean hell, there’s literally an instance of an “it’s too cold” episode being back to back with an “it’s too hot” episode. As crazy as this will sound, I also don’t like Hawkeye very much a lot of the time. The show was always a bit too much of the Hawkeye show, but it was around season 7 where it got to be extreme at times with it. As good as the character is at heart, his outspoken jealousy/anger of anything that isn’t all about him, his attitude towards women (especially episodes like Inga), his holier than thou attitude, his ego (which honestly rivals Charles’, just in a different way) just gets too be way to much for me. Margaret also changes a lot between seasons 5 and 7. She wasn’t the best character before that, but she was at least tolerable, and her hi-jinks with Frank were comical. Once she got engaged though, and then married, she just turned into a sour, angry, terrible character. There were multiple times during season 7 where I found myself fast forwarding through scenes with Margaret because all she ever does is yell and scream. Seriously go back to any season 6, 7, or 8 episode and take note of her scenes where shes yelling and being a big beyotch compared to scenes where she’s not. The ratio is pretty bad. Radar was also absent for a lot of Season’s 6 and 7. Season 8 is not very good either, but I feel it’s a little bit better than 7, as Klinger/Mulcahy got more screen time, & Winchester became a much better character. This made up for how awful Hawkeye/BJ/Margaret, and Potter a lot of the time were. I guess the short version of what I’m trying to say, is the best thing about MASH for me was the characters. Trapper, Blake, Radar, Mulcahy, Klinger, Potter (sometimes), Winchester (usually) and even Burns. In the later seasons there’s way too much of the characters I really don’t like (BJ, Hawkeye, & Margaret) and those characters get worse than they were before. I’ll be starting season 9 on DVD today, so I’ll keep commenting on all the episode spotlights for season 9 episodes as I do. An excellent episode, in spite of all the suspensions of belief there were. BJ: All we have is a definite possibility of a firm maybe. Everything about this episode was great, though one thing does pique my interest. How would huckleberry-kumquat preserves taste like? I’ve never had either fruit in my life. In closing, I’d like to know why the montage of scenes discussing potential party dates got cut in syndication. Charles: Valentine’s Day? Delightful. They can all meet in a garage in Chicago. There’s just one other thing that kind of gets me about this episode: according to Hawkeye’s comment, the passage of time has led us to Easter when the letters from home arrive, yet everything still seems the same, they’re still wearing long scrubs in O.R., the Swamp still has its winter canvas down, unless there’s still a frigid coldsnap going on, shouldn’t it be well into spring by then (or at least look it)? What was the problem Charles had with how Radar’s Mom wrote the word idea.Did she spell it idear? Yes, she did. She also used the word real improperly, in Charles’s opinion. Charles (reading Radar’s mother’s letter): Dear Walter, Your uncle Ed and me were real excited about the get together. We love the whole idear. Hawkeye: I could pack a 30 piece china set in ten minutes flat. Less, if they didn’t mind a 60- piece set. Say what you will, this was a very well-acted episode. Charles’ reaction to how well his family hit it off with the O’Reilly’s was the best-his family was clearly less snobbish than he was; maybe his entire attitude was him trying to make up for it in some way? I didn’t much like earlier, Trapper era Hawkeye but later Hawkeye was more mature and compassionate, as was Margaret. The whole subplot about Klinger was just unbelievable. Surely his mother would have had some clue as to where he was going when he went into the Army, and the rest of his family obviously knew. What about his letters home? She would surely have seen the overseas postage. Hawkeye’s skepticism is believable, given the time and distances involved. I like to think Margaret’s father was able to use his influence in some way to facilitate things. I’ve often thought that about Charles’s family as well. Sometimes it’s the second or third generation of “old money” that really become snobbish. A lot of the first generation, and in America from about 1840-1920, that was the generation that “earned it,” that built the fortune and never lost sight of their working class roots. I can see that from the off screen Winchesters. I attended a public high school in an area that had a lot of new money and old money. Often the spoiled brats were the grandkids or even the kids of those who earned it. The main characters were the only ones in the pick a date montage and so I always figured it was just them which wasn’t very plausible that that particular group of characters would have that party. “It was the senior staff” you might say, well no, it wasn’t Klinger was just a random orderly. “Well, they were friends” you might say but no I don’t think CEWIII was quite there yet. I get that it was the main characters though. Aside from that I love this episode. It was nice hearing about these loved ones most of whom we already knew about, meeting each other. RE: Kelleye and BJ in the truck. I’ve always found it a bit off-putting that BJ kisses her on the mouth in that scene. A married doctor and a fellow officer, one would think a cheek kiss would be more appropriate. But I also look at it, as that flap in the tent is very small and it would probably be tough for both actors to move their heads for a cheek peck. Something I always thpught about this episode is that it would have been a nice touch if they mentioned inviting Trapper and his wife and also Henry’s widow and kids. Why would Hawkeye’s father address him as Ben and not Hawkeye? Wasn’t he the one who gave him the nickname because he loved The Last of the Mohicans? This is the problem with different writers on a show. Some know the show really well and others don’t. Because Ben is Hawkeye’s given name. Of course, Hawkeye kind of rode Mulcahy because the priest’s sister who was a nun called him Francis in her letter. Mulcahy: Well, you wouldn’t expect a sister to call her brother Father. If it was far fetched, it apparently also was something some young men genuinely thought they could fool their families back home with…. and if I know one example I can only assume it must have been a common story to soldiers in those days stationed overseas. The writers must have heard a similar story somewhere… about a relative or someone fighting in Vietnam, WW2 or Korea I guess. The thing that makes it so perfect though is that Klinger’s mother knowing all along he was in Korea was actually pretty similar to how the man I know was also outed and the family knew all along where he was. And his sister sent him a picture of him from the New York Times showing that he couldn’t keep this story up anymore. He was well into his 80s when I met him and it was just a funny story about his 20s in the late 1930s. So Jamie Farr’s reaction to his mother finding out was right on with me. For someone who claims the funny pages are just a blur on the way to the financial section, Charles makes a number of comic related statements here he references Blondie and Dagwood, in “Ain’t Love Grand” he referred to the hamburger eating call girl at Rosie’s as Whimpy.